The first and most basic artificial light source was of course fire. For tens of thousands of years it has provided man with the basic needs for light, heat, protection, and a means of cooking. But it has also served an equally important symbolic and religious role in every culture. Fire has played an important role in almost every religious tradition. 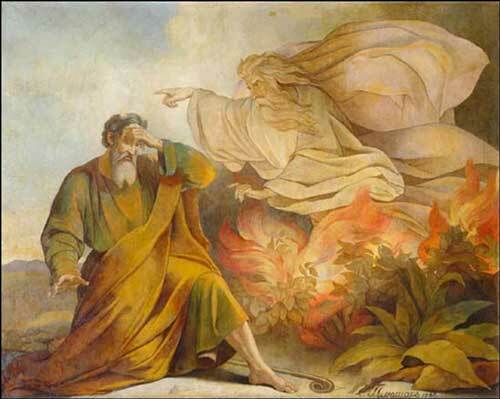 For instance, in the Judeo-Christian tradition God manifested himself to Moses as a burning bush in the Book of Exodus (3:1-21). It's also mentioned several other places in the Old Testament including the Pillar of Fire in Exodus 13:21-22. It was one of the manifestations of God that provided light to the Israelites so that they could travel by night during the Exodus from Egypt. “By day the Lord went ahead of them in a pillar of cloud to guide them on their way and by night in a pillar of fire to give them light, so that they could travel by day or night. Neither the pillar of cloud by day nor the pillar of fire by night left its place in front of the people”. In Greek mythology, the Titan Prometheus, defied Zeus and is said to have brought fire to mankind in the form of a giant flaming fennel stalk. For his betrayal, he was tied to a rock where a giant eagle ate his liver each day only to have it regenerate and have it eaten again. The story conveys both the symbolic and functional importance of fire to mankind. As a province of the gods it was seen as sacred and when debased by giving it to mere mortals Prometheus deserved such a severe punishment. 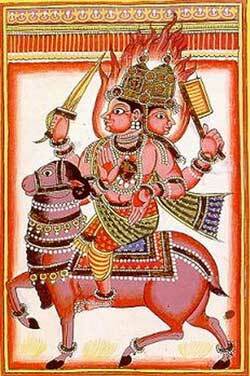 In Hinduism, the god of fire, Agni is one of the most important of the Vedic gods. As the god of fire he is the acceptor of sacrifices and acts as a messenger to the other gods. 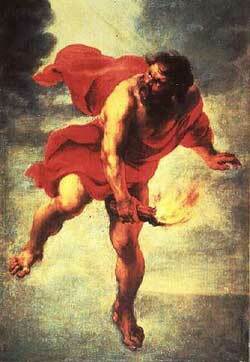 As the god of fire he is manifest in every hearth and as such the making and use of fire becomes a religious act. Over time ritual practices developed to govern and guide users in the proper use fire. One ritual involves the correct alignment of themselves, the fire, and the larger cosmos by facing the appropriate cardinal direction. For instance, when making sacrifices to the gods the fire must face east. When making sacrifices to the dead the fire must face south and when cooking food one must always face west. Agni is also the primary witness in every Hindu wedding ceremony and no Hindu wedding is complete unless it is done so in the presence of the Sacred Fire. 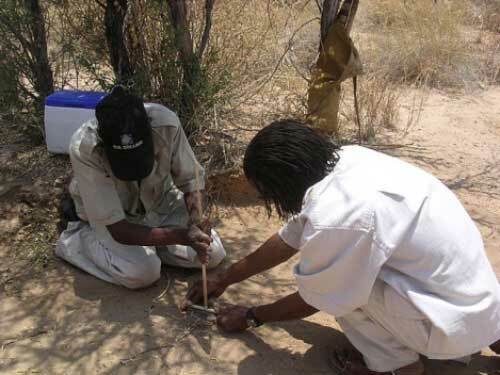 The first evidence of the controlled use of fire in a hearth dates to approximately 1,250,000 years ago in the South Africa's Swartkrans region. It most likely consisted of keeping a fire rather than starting it. Early man would have collected burning ashes or coals from naturally occurring fires and kept them smoldering in dry plant material for extended periods of time. When needed to rekindle the fire dry tinder would be added to the coals. If wrapped tightly in a waterproof container it could be easily transported and kept for several days. 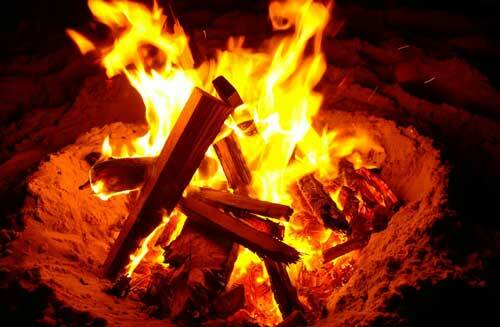 The first evidence of man-made fire dates to about 500,000 B.C. These early fires were probably made either by friction or by sparks from flint and pyrite. To produce sparks, early man probably used a hard stone such as flint and then struck a second stone such as pyrite that contained iron. When the resultant sparks came in contact with dry tinder they would begin to smolder and ignite. 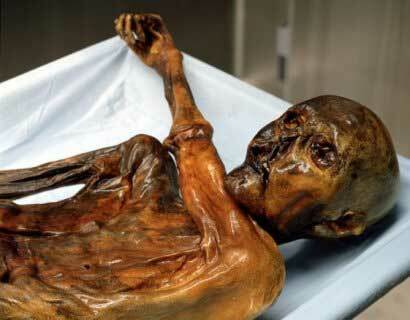 In 1991, the frozen Neolithic man “Otzi” was discovered with a fire-making kit that included flints, pyrite, dry fungus and cedar embers wrapped in leaves. The earliest friction tool was probably the hand drill. It consists of a thin, straight wooden shaft that is spun with the hands. One end of the shaft rests in a notch in a soft wooden base. The repetitive spinning generates heat that ignites dry tinder. 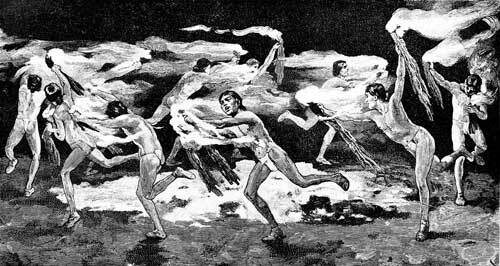 As people huddled around the fire for warmth and light it became a centralizing force for human activity. The high luminous contrast between the area immediately surrounding the fire and the outlying areas helped focus attention towards the fire. Storytelling and religious ceremonies were typically performed around the fire and focused everyone’s attention and heightened their emotional impact. The modern desire for a fireplace in even in climates where it is not needed can be seen as a deep-seeded desire to maintain that emotional connection.